Boy of Summer: Harold Baines for the Hall of Fame? Harold Baines for the Hall of Fame? It amazes me that I'm even writing this. It seems to me that if you've got a player whose main job, nay, ONLY job for most of his career was to hit, he ought to have some damn impressive stats if you're going to talk about putting him in the Hall of Fame. Harold Baines won a Silver Slugger and was a six-time All-Star, but Darryl Strawberry made eight All Star teams, Frank McCormick nine, and Steve Garvey ten. Bill Freehan went to 11(!) All Star Games, and when he came up for election, he got two lousy votes and promptly fell off the ballot. A Designated Hitter ought to amass 200 or more hits at least once. A run producer should pile up 100+ RBIs more than three times in 22 seasons, or score 100 runs, even 90 runs, at least once. A great slugger ought to lead the league in slugging more than once, or hit 30 homers at least once, or at least be among the league leaders occasionally. Harold Baines did none of these things, and yet there are still folks out there who think he belongs in Cooperstown, along side Ted Williams and Joe DiMaggio and Carl Yastrzemski and Dave Winfield. Scott Merkin, a White Sox beat writer for MLB, is one of them. He's got a column on the MLB website calling for the longtime Pale Hose wearer to get some serious consideration for Cooperstown. To make his case for Baines, Merkin interviewed such non-partisan folks as White Sox GM (and former Baines teammate) Kenny Williams, White Sox owner Jerry Reinsdorf, White Sox color commentator Ken "Hawk" Harrelson, and Harold Baines himself. Way to keep it neutral there, Scotty. I have never thought of Baines as a Hall of Famer, and usually just glaze over his candidacy with a few sentences between discussions of more serious candidates. Apparently few of the BBWAA voters have either, only about 28 of them, out of the 540 or so who get to vote. This is important because their opinions, unlike mine, actually matter. Merkin and others like him will need to change the minds of almost 400 of the BBWAA writers, which is unlikely. Clutch hitting for Baines [...] led to an amazing 1,628 RBIs despite only topping the 100-RBI plateau in 1982 (105) and 1985 (113) with the White Sox, and with Baltimore and Cleveland in 1999 (103). Baines turned 40 before the 1999 campaign. It's a model for consistent excellence on Baines' part, accomplished the right way through dedication on and off the field, without any questionable shortcuts. First of all, being 28th all-time at something does not constitute "amazing" in my book. A-Rod is right on his heels, and will pass him before the end of May next year. Jim Thome and Carlos Delgado are about 140 RBIs back, and could both pass him in the next two years, without necessarily even being much good. Chipper Jones is about 250 back, and could pass him inside of three years easily. Any two of those four will push Baines out of the top 30, and thus his best case for Cooperstown will weaken quite a bit. Also, it's hard for me to agree with "consistent excellence" as an appropriate term to describe someone who hit, on average, .289 with 22 homers per 162 games. (His actual average per season was about 17.5 homers, because he rarely played more than around 145 games worth of the Chicago White Sox schedule.) More like "typical goodness" which sounds a lot less compelling. Sure, I'll give him three snaps in Z formation for not using steroids, but then do we even know that for sure? He played almost half his career in the so-called steroids era, and suffered little apparent drop off in skills as he went into his late 30's, when most players slow down. 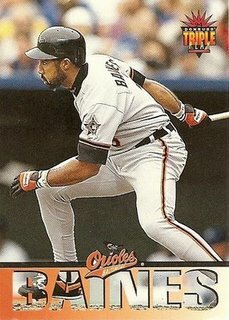 Baines hit the second most homers of his career at age 40, in 1999, the height of the PED era, and also had the third highest slugging percentage and RBI totals of his career that year, then fell off the table, hitting just .254 with 11 homers in Y2K. If players as mundane as Jason Grimsley and Ricky Bones and Hal Morris and David Justice and dozens of others were all using, is it so hard to believe that Baines could have, too? Even assuming that he was clean, was he the amazing clutch hitter that Merkin makes him out to be? White Sox owner Jerry Reinsdorf and GM Kenny Williams think so, but then if you asked any owner and/or GM about a longtime fan favorite on the Cooperstown ballot, they'd probably say something nice like this. But is there any (non-anecdotal) evidence? Baines hit .289/.356/.465 in his career overall, and while he did hit .313/.387/.427 as a pinch hitter (presumably a clutch situation, most of the time), his "Close & Late" numbers (.284/.360/.474) and other clutch stats hover right around his career marks. In short, there's no evidence that he was any more clutch than anybody else. "What really has bothered me for a long time is that if we hadn't traded him, he would have his 3,000 hits and he would be a lock for the Hall of Fame. We traded him twice and into bad situations where he was a platoon player. If he stayed with us, he would have gone over 3,000 hits. If he doesn't get in, it would really bug me. I talk to him about it, and he just shrugs it off." In 1989, he was traded to Texas on July 29th, and he played in only 50 of the Rangers' remaining 62 games, but not because he was a platoon player. He got five sporadic days off, but then missed seven consecutive games in September, after being pinch hit for in the 6th inning of the last game before the missed week. We have to presume an injury here, and if so, we cannot presume health if he'd stayed in Chicago. So at best maybe he gets five more games. But does he really? The White Sox had not played him every day either, as he appeared in only 96 of the team's 102 games up to that point, a day off every 17 games. In Texas, not counting the alleged injury, he sat about once every 11 games. So that gives him less than two more games, if he sits once every 17 instead of once every 11. Hitting .321 (his White Sox BA that year) in those two games would give him maybe three more hits. Woo hoo, only 131 to go! But his performance slipped a bit too when he went to Texas, his batting average dropping from .321 to .285. There's no saying why this was, but let's just pretend that Harold was sad when the ChiSox traded him, and didn't hit as well because of it, and that he would have continued to hit .321 in the remaining 52 games in 1989, instead of .285 in 50 games. How many more hits would that have gotten him? That would give him 58 hits in 188 at-bats instead of 49 hits in 172 at-bats, his actual numbers in Texas. So we've got a total of nine additional hits. Down to 125. The next year he split between Texas and Oakland, hitting .284 with 118 hits in 415 at-bats. Baseball Reference says that if he'd spent the whole year with Chicago, he'd have had 115 hits in 412 at-bats, three less than his actual total. But let's also assume that he'd have gotten more than the 135 games they gave him in Texas and Oakland, too. Some of that was due to normal days off, but others may have been injury-related, like when he missed three games in May after playing all of a doubleheader, or when he missed nine games in July, after a game started in which he only got one at-bat, and had only a two-inning appearance in right field in the middle. He played only 103 games of 129 with Texas before the trade to Oakland, where he actually did play every day (and hit only .266). We can't give him the 12 or so he presumably missed due to some ailment, so we'll give him seven days off (one every 17 games, like in 1989 with Chicago), plus the 12 due to boo-boos, which leaves him with 143 games played instead of only 135. With four plate appearances per game, he gets 32 more plate appearances at most, but he did walk some, so that takes away about four plate appearances. Hitting a 1990-Comiskey adjusted .279 in 440 at-bats instead of the .284 in 415 at-bats he actually compiled gives him 123 hits that year instead of 118. That's five more hits, and we're down to 120. I'm not going to make adjustments for the five years in between Baines' first and second stints with the White Sox. He spent two seasons in Oakland and three in Baltimore, never playing more than 141 games in a a season. Let us presume that this was because he was a 30-something DH with bad knees and not because his managers didn't care about getting him into the Hall of Fame. If that's the case, there's little reason to think that he would have played more often in Chicago than he did in Baltimore and Oakland. Furthermore, adjusting for ballparks (via Baseball Reference) shows that Baines would have had fewer hits, not more, playing half his games in Comiskey, a slight pitcher's park. We'll leave well enough alone there. Anyway, the second trade Reinsdorf was talking about happened in late July 1997, two days before the famed White Flag Trade. Baines had played 93 of the team's 103 games to that point. When he went to Baltimore, he was in a platoon, mostly with righty Geronimo Berroa, who hit .277/.366/.426 after Baines' arrival. Baines, for his part, hit .291/.356/.418 for Baltimore, playing 44 of the team's remaining 59 games, but his OPS was 120 points lower against lefties than righties that year, so it seems the platoon was justified. Reinsdorf would have you believe that Baines would not have been platooned in Chicago, but with 1B/DH Frank Thomas hitting .347 that year, I find that hard to believe. Thomas hit .344 against righties that year, and therefore did not need to be platooned, but if they only used Baines as a DH against righties and played Thomas at first those days, Baines still would have gotten less playing time, not more. Even if we believe Jerry's argument and we give Baines nine more games (6 games off in the remaining 59) and about nine more hits (using the same .300 batting average and the same ratio of at-bats to games played). Now he only needs 111 for the Hall to come calling. The next year he was platooned again, this time with Joe Carter and Eric Davis, mostly, but he also missed about 32 games from late June to early August due to an injury, so at best he might have played 117 games that year (with the normal game off every ten days) instead of the 104 he actually played. This exercise typically picks us up about one hit per game, so we'll give him 13 more hits, and now he "only" needs 98 more, and they're obviously not going to be found. By this point in his career, Baines was a part-time player, and deservedly so. He wasn't getting to play as much because most clubs, including the White Sox, had better options at DH than a 38-year old who couldn't hit lefties and didn't have much power. Reinsdorf is just flat-out wrong. "He's going to have a tough time [getting HoF votes] because for a good part of his career he was a designated hitter and a lot of writers won't vote for a DH,"
No, writers will vote for a DH if he's good enough, as they did for Reggie Jackson, and as they will for Edgar Martinez and Frank Thomas. It's not because Baines was a DH, it's because he wasn't a great DH. Many people will forget Baines' natural ability as an outfielder during the early portion of his career, finishing with 10 assists for three straight seasons from 1981 to 1983 and with 15 assists in 1986. But Baines did not play the field from 1993 through his retirement in 2001. Assists are not the best measure of an oufielder's defense, but they are a measure. In this case, Baines' 15 assists were not in the top 30 among outfielders between 1980 and 1986, the last year he played the field regularly. The 10 assists he had in other years probably would not be among the top 100 marks in those seven seasons, and he never won a Gold Glove. That's not everything, but it tells you that he was never considered one of the three best defensive outfielders in the league when he played. Surprisingly, according to Baseball Prospectus he was a pretty decent outfielder, good for between 11 and 17 FRAA (Fielding Runs Above Average) each year from 1983 to '86. That's not fantastic, but it is pretty good. Still, you can't give him credit for what he might have done with good knees without throwing everything else off, so we have to evaluate him based on what he actually did, which was DH. And as a DH, he just doesn't measure up. It's not Reinsdorf's fault. It's not the voters' fault. Baines just wasn't great enough. Being "pretty good" for 22 years should not be, and will not be, enough for Cooperstown. This is an outstanding article. I'm Chicago born-and-raised, a lifelong White Sox fan, and will always (as will the rest of Chicago) love Harold Baines. However, I've made the argument for the last few years that as primarily a DH for most of his career, his numbers should be held to a higher standard. If he were to have reached both 3000 hits and 500 HR, I say put him in. If he even reached one of those milestonesm his case would be better. Harold, forgive me, I feel like a traitor, but you fall a little short her. His body type never changed, he never got faster nor did his body SUDDENLY break down. Harold Baines was a quiet leader in the clubhouse and on the field. His bat and skill did the talking, unlike current day players. To compare him to A-Rod is preposterous. A-Rod is playing in current day, with current day medical staff and advances in treatment of injuries, admitted to using steroids (how anyone could have had any doubt I am in shock) and he gained at least 50 pounds of muscle. Full of talent? Of course he is, but talent doesn't mean $hit when you cheat. In addition, Baines has become an essential coach on the field in recent years. He has the most RBI's of ANY player that is not currently in the Hall of Fame. Add to this that his numbers are better than Tony Pena (who is in the hall) and I think your argument has been taken apart, word by meaningless word. Feel free to e-mail me for further discussion, kagent5@hotmail.com I'll look forward to more absurdity and arrogance. I mentioned A-Rod in passing one time because I expected him to pass Baines in RBI, and he did just that. I did not bring him up because I think they deserve to be mentioned in the same sentence for any other reason. Rodriguez is a vastly better player than Baines ever was, steroids or not, but he's not Baines' competition for Cooperstown. Baines was rarely among the best players in any given year in his own career, and that's a huge knock against him. Baines does not have the most RBI of anyone not in Cooperstown, but he does have the most of any eligible player not in the Hall. But so what? That logic would mean that we let everyone in eventually, as there will always be someone on the list who has the most [something] without having been voted into the Hall. First Baines, then Andre Dawson, then Dave Parker, Rusty Staub, Joe Carter, Andres Galaragga...where do you draw the line? Jimmy Ryan has the most runs scored of any eligible player not in the Hall, and I don't hear the masses clamoring for his induction. And the fact that he's now a coach? What the hell does that have to do with anything? Lots of guys become coaches after their playing careers, many of them good ones, and none of them has been or ever will be inducted into the Hall of fame because they knew when to send the runner from third. And so what if he has better numbers than a marginal Hall of Famer like Tony Perez (not Pena)? Rusty Staub has better numbers than George Davis. Andres Galaragga has better numbers than Jim Rice. Chili Davis has better numbers than larry Doby. Almost everybody has better numbers than Bill Mazeroski. Let's not try to remedy one mistake by making another. I don't see the absurdity or arrogance of this line of thinking, but if you can argue with the logic, I'm all ears. Over 2800 hits and with an enviable consistency over a long career, but that's not worthy of HOF inclusion? Sorry to see that you also dismissed Rusty Staub out of hand, another worthy player who has been inexplicably ignored for HOF consideration. I get very tired of the so-called "expert" writers who have the power of the HOF vote rejecting players the caliber of Baines on the basis of every HOF'er needing to measure up to the Babe Ruths ... seriously, that doesn't make the Hall more meaningful, it suffocates the spirit out of it and ultimately CHEAPENS the honor.